Old fashioned brownies are rich, dark chocolate brownies with a soft chewy center, firm edges and a crackly top. Easy and simple to make using just one bowl. A family favorite! UPDATED: I originally posted this recipe in January, 2015 and it has been one of the most popular recipes on my site – especially around Valentine’s Day. So I have updated the recipe with step by step photos and added some tips to show how easy it is to make these old fashioned brownies. Hope you enjoy it! Since Valentine’s Day is coming up I thought I’d share with you a recipe for old fashioned brownies. These brownies have a soft chewy center, firm crisp edges and a sugary, crackly top. They are rich, chewy, fudgy, dark chocolate brownies. They are super simple to make – using just one bowl. So make yourself or someone you love some of these old fashioned brownies. Prep and measure out all your ingredients so they are ready to go. Add cocoa and baking soda to a large bowl and stir to combine. Add half the melted butter to the cocoa mixture and stir – it will form a thick paste. Add boiling water to the cocoa mixture. Stir to combine water and cocoa mixture – it will be very liquidy and it won’t be completely smooth – which is okay. Add sugar, eggs and the rest of the melted butter to the mixture. Stir completely to combine all ingredients. Shift flour over chocolate mixture and add vanilla and salt. 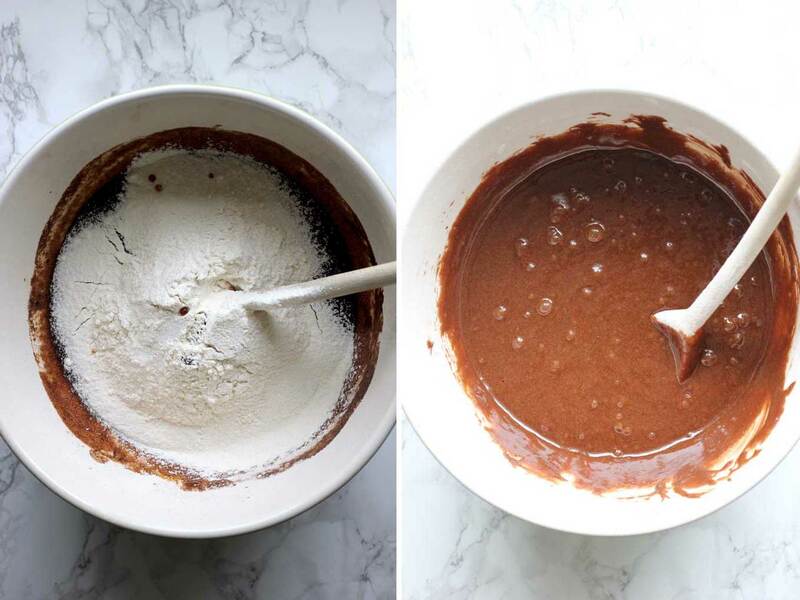 Stir to incorporate flour completely – scrape down sides occasionally as you stir. Add chocolate chips to the brownie mixture. Stir in the chocolate chips to combine with the brownie mixture. 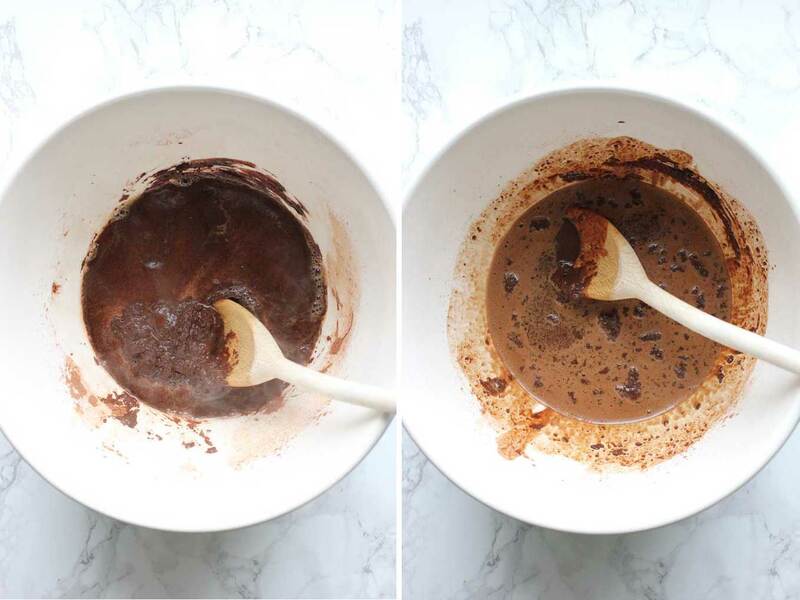 Pour brownie mixture in to a greased baking pan and smooth the top with a wooden spoon. 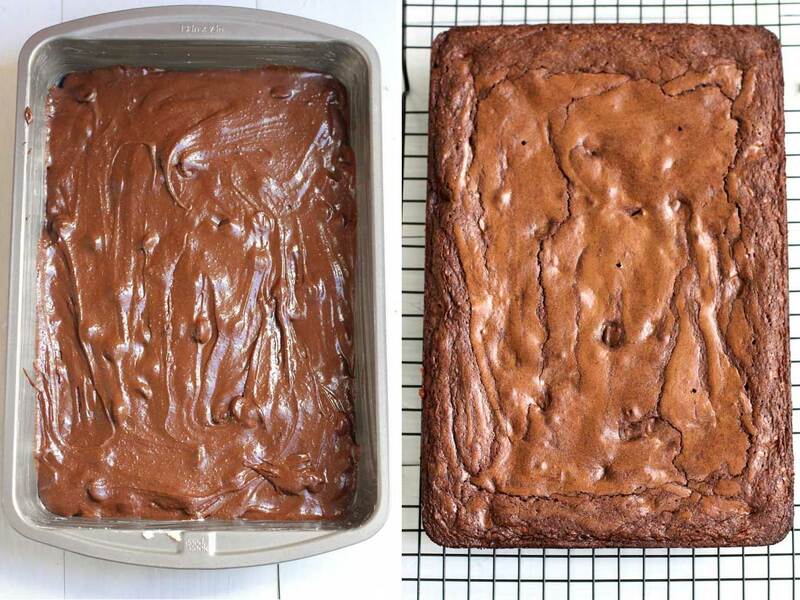 Once the brownie is baked, let cool completely before cutting into squares. I make these brownies all the time and they come out consistently every time – chewy, rich and with an intense dark chocolate flavor. I like these old fashioned kind of brownies. They are the chewy, fudgy kind with firm edges and a softer center. 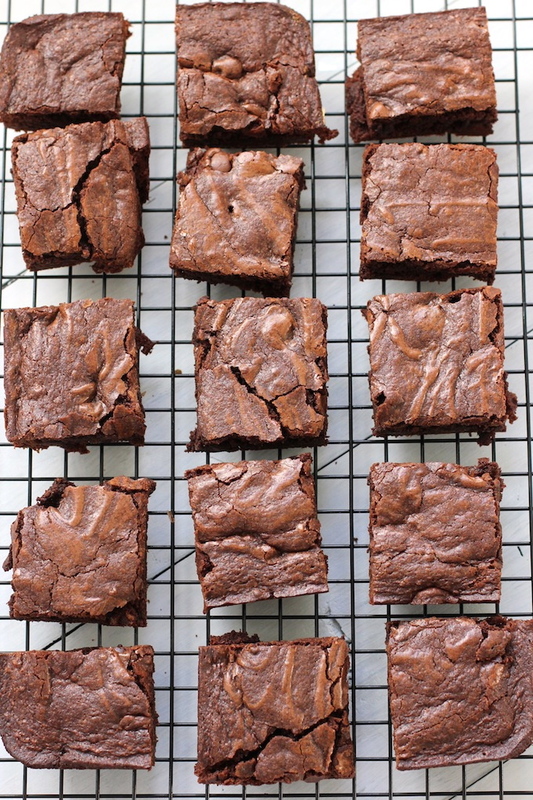 My friend told me we could be brownie buddies since I like the softer center brownies and she likes the firmer outer edge brownies – especially the corner pieces. A lot of readers have made these with their kids or grandchildren – so if you’re looking for a fun recipe to make with your family then this recipe is for you. It’s important to let the cooked brownie cool before remove it from the pan. If you try and remove it too soon the whole brownie could break up into a bunch of pieces – so wait about 30 minutes before flipping the whole brownie out of the pan. Once the brownie has cooled in the pan, gently loosen around the edge of the pan and the brownie with a thin metal spatula, you should then be able to easily flip the brownie out of the pan. Also, you’ll get a cleaner cut on the individual brownies if you wait for the whole (uncut) brownie to cool and slice it up once it’s out of the pan. I used dark chocolate chips which gives these brownies a rich, dark chocolate, slightly bittersweet flavor but if you wanted to lighten the brownies up a bit you could use regular chocolate chips. 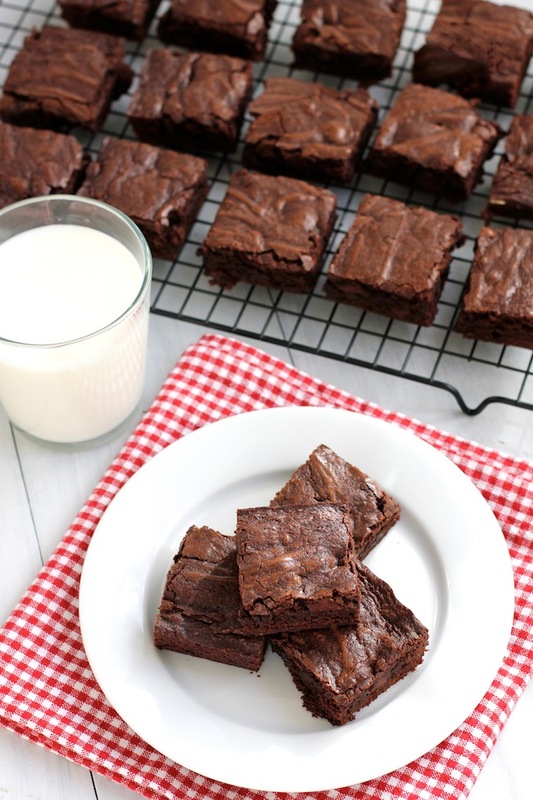 Did you know that brownies will cook more quickly in a metal pan versus a Pyrex pan? I cooked mine in a metal 9 x 13 non-stick pan. If you are using Pryex you may need to cook your brownies a little bit longer than stated in the recipe below. There are all kinds of interesting brownie tips in this article. This recipe is from Hershey’s kitchens. They have a lot of great recipes – so go check out their site if you’re looking for a great chocolate baking recipe. A rich, dark chocolate brownie with a soft chewy center, firm edges and a crackly top. These old fashioned brownies are easy and simple to make using just one bowl. Grease a 9 by 13 baking pan. Melt 2/3 of a cup of butter over low heat on the stove (or melt butter in the microwave). 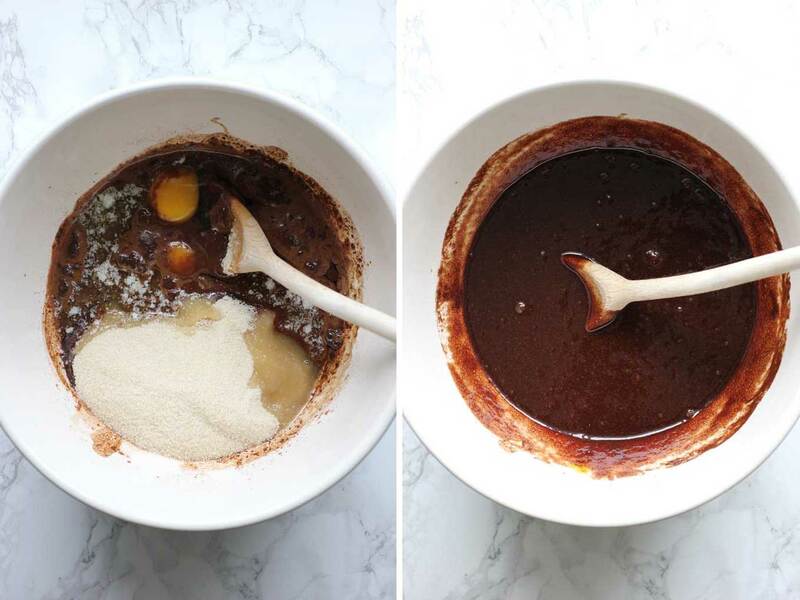 With a wooden spoon, stir 1/2 of the melted butter into the cocoa and baking soda. Stir until combined. Add 1/2 cup of boiling water to bowl with cocoa and butter. Stir until combined. Add sugar, eggs and the rest of the melted butter to the cocoa mixture. Stir until combined. Sift in 1 1/3 cup of flour. Add vanilla and salt. Stir until combined and batter is smooth. 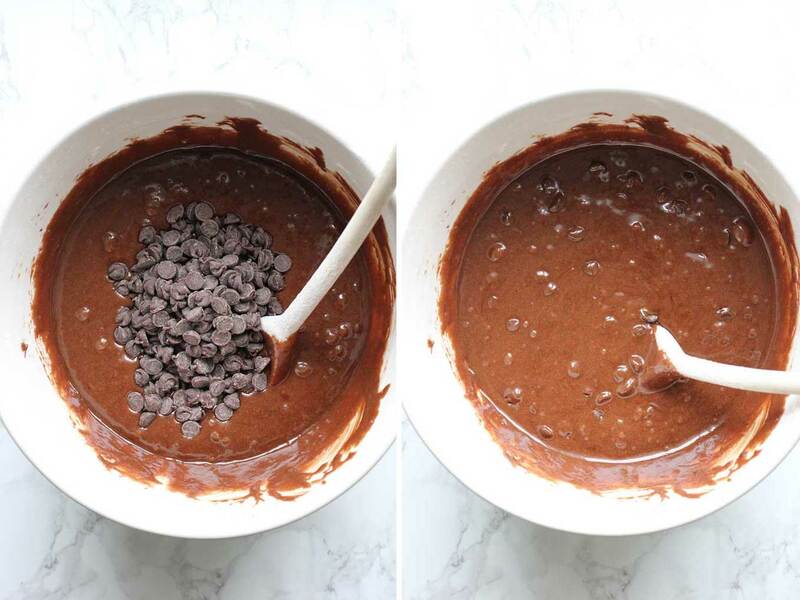 Add dark chocolate chips to batter and stir until combined. Pour into prepared baking pan and smooth the top out with a wooden spoon. Bake for between 35 and 40 minutes. Mine took 35 minutes. Test with a toothpick for doneness. Cool for 30 minutes in pan. When cool, remove from pan and cut into 24 brownies. It’s important to let the cooked brownie cool before remove it from the pan. If you try and remove it too soon the whole brownie could break up into a bunch of pieces – so wait about 30 minutes before flipping the whole brownie out of the pan. Once the brownie has cooled in the pan, gently loosen around the edge of the pan and the brownie with a thin metal spatula, you should then be able to easily flip the brownie out of the pan. You will also get a cleaner cut on the individual brownies if you wait for the whole (uncut) brownie to cool before cutting it up into squares. If you make this recipe and enjoy it, come back and let me know by leaving a comment and a rating. I’d love to hear from you. This is a wonderful recipe – I’ve made it many times. It also adapts well to making into a homemade mix. Just measure all of the dry ingredients into a bowl, and stir with a whisk to combine. Transfer to a mason jar for storage. 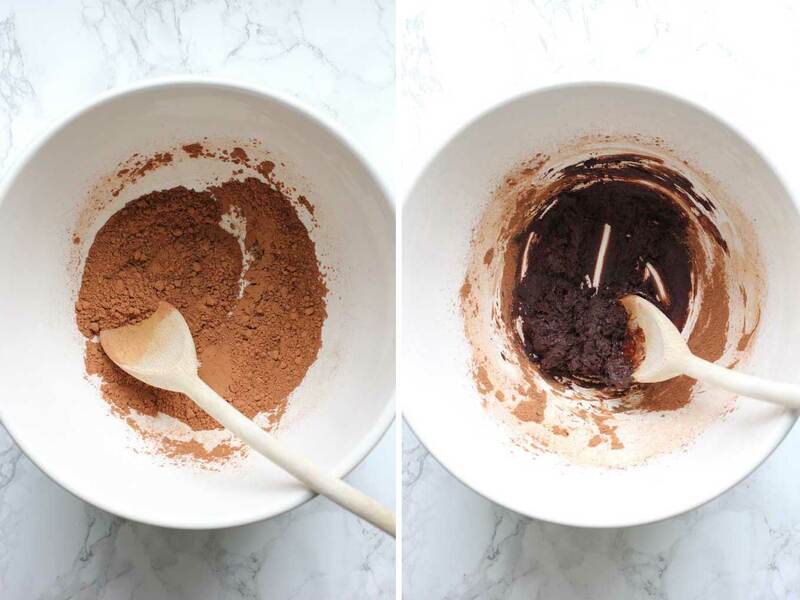 When ready to make brownies, empty dry mixture into a bowl, add wet ingredients all at once. After mixing, add chocolate chips. Bake as directed. Hi Julia – glad you enjoyed it! I can hardly think of a time when I’m not craving brownies that are chewy and rich with an intense dark chocolate flavor! You’ve hit the ball out of the park with this one, my friend! I have a true weakness for brownies! These look amazing! 🙂 I need to give these a try right away. Love your update Geraldine and hooray for favorite chocolate brownies! Perfect for anytime, but valentines day especially! Thanks so much, Traci – these are a big reader favorite – so they were due for an update. A soft chewy center, firm edges and a crackly top are everything I’ve ever dreamed of in a brownie! These look amazing! Thanks, Kelly! Hope you give them a try. 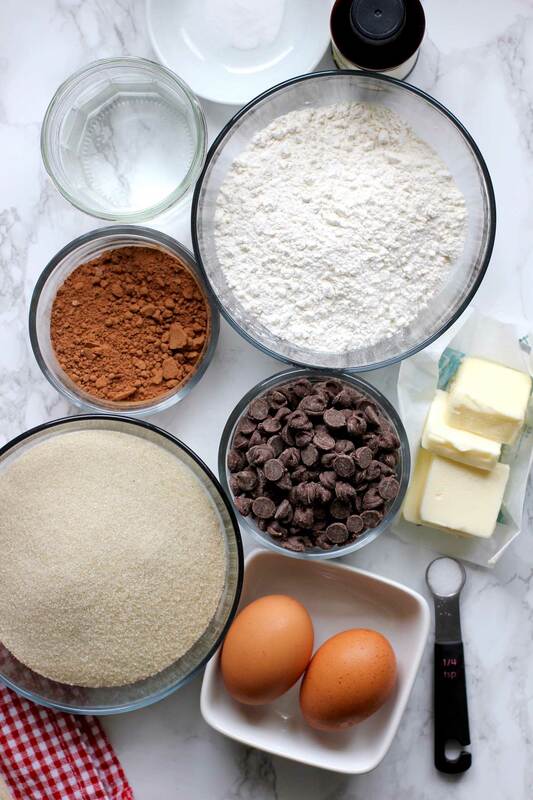 I used to have a recipe that was my go to, but it wasn’t chewy or fudgy enough so I went on the hunt for a brownie recipe that would satisfy my famil, friends, and I! Since I found this recipe a few months ago, I’ve made it for my family, gifted a friend, for my roommates on a trip this past January, for a club fair to entice the freshmen (and all of the above) at my college, and I’m about to make some for a kid my mother babysits (as a gift)! This recipe has never failed me. Even my mother is a very critical woman, especially when it comes to what I cook or bake because she knows this is my passion and she wants me to succeed, she said that these are the best brownies I’ve ever made! I also never have butter at home, so I just use Country Crock. You never get the crinkly top, which is disappointing, but the top but really shiny and glossy and it tastes great! Wow – Thanks so much for letting me know, Makaila! So glad you are enjoying and sharing these brownies with friends and family! Thanks again for taking the time to leave a comment – I appreciate hearing from you! Perfect brownies. I substituted some white sugar for brown. But either way they are amazing and you’ll never use a box mix again. Thank you! Thanks so much, Rare – so glad you enjoyed them! Thanks for taking the time to let me know and leave a star rating – I really appreciate hearing from you. These are delicious and easy. Better than a mix and I prefer to use butter. I wouldn’t alter this as each ingredient brings a neccessary element. Thanks so much, Jennifer – glad you enjoyed them! Hi Cecile – that’s so great! I’m so glad you are enjoying them! Thanks so much for letting me know, I really appreciate hearing how it turned out for you (and your cats 🙂 ) and thanks for leaving a star rating as well. Hope your daughter has a wonderful birthday! Wow looks sooo good. what is the size of the cup? Hi Isu: A cup is 8 ounces. Hope you try them. How many brownies does this yield? Thanks! Hi Alanna – it makes 24 brownies – but you can make them bigger or smaller depending on how you cut them up. I am 70 and this is the absolute best brownie recipie EVER! Hi Carol – Thank you so much for letting me know! I appreciate you taking the time to leave a comment and rating. Everyone really likes these brownies! What can I substitute eggs with, if I want an eggless recipe? I’m sorry – I only know how to make this recipe with eggs. Maybe try finding a vegan recipe on google? You can use aquafaba, flax “eggs” or chia “eggs”. I substitute with these often in baking because some of my coworkers are vegan. I haven’t tried aquafaba or other vegan versions so not sure it this will work. Thanks for the suggestions though. Can you use already made fudge just cut it up instead of chocolate chips. Hi Rhonda, sorry but fudge won’t work. If you don’t have chocolate chips, you can try chopping up a bar of chocolate into small pieces so that it equals one cup. Can. Make these without the chocolate chips without adjusting any other ingredients? Thanks! They look just like them! Sorry for the late reply, Deborah – but you need to put chocolate chips in brownies. Thanks for asking! I have these in the oven now. I have some homemade Bailey’s buttercream frosting that I am going to smear over the top when they cool. Bailey’s buttercream frosting sounds great! Hope you enjoy them, Jackie. I made these with my grandchildren for Valentine’s Day. We added maraschino cherries and a bit of the juice. They put them in small pieces tins and baked them. They came out great. The children gifted them to their parents. That’s great idea, Julie! And what fun way to spend time with your grandchildren. Glad you enjoyed it. Made these delicious brownies for my birthday, so easy. Love that you made these for your birthday! Thanks for the rating – much appreciated! I was wondering if you could add peanut butter to this in mounds & swirl it through the batter? TYIA. Hi Carman: I have not added peanut butter to this so I’m not sure if it will work. I looked up swirling peanut butter into brownies on google and it said that you need to prepare the peanut butter by adding melted butter and powdered sugar – I’m assuming this is to make the peanut butter more “swirlable” since peanut butter is so thick. I’d suggest looking it up on google for measurements. Let me know if it works out! Yes, any quality brand will work well. You just want to make sure you buy 100% cacao. Hope you enjoy them. Does the butter and eggs need to be at room temperature? Hi Samantha – you are going to melt the butter so it’s fine cold. Also, I just used eggs right out of the fridge. Hope you enjoy them! Thanks so much for letting me know you and your family enjoyed them, Kathy! Thanks so much for letting me know and so glad you enjoyed them, Jade! Happy new year to you! I just made the brownies with my 4 year old. Very simple to make. I lined my pan with parchment for easy clean up. They look just like they do in the picture and delicious! Thanks so much for letting me know, Patti. What a fun way to spend time with your 4 year old! Hi! This recipe looks fantastic, definitely will be trying soon. Can the melted butter be replaced with oil? Hi Joy – I haven’t tried switch out the butter for oil. Let me know if it works out! Darn, I was hoping in the comments would be someone saying they made this successfully with a gluten free all-purpose flour substitute. My daughter has Celiac and is missing good old fashioned brownies. 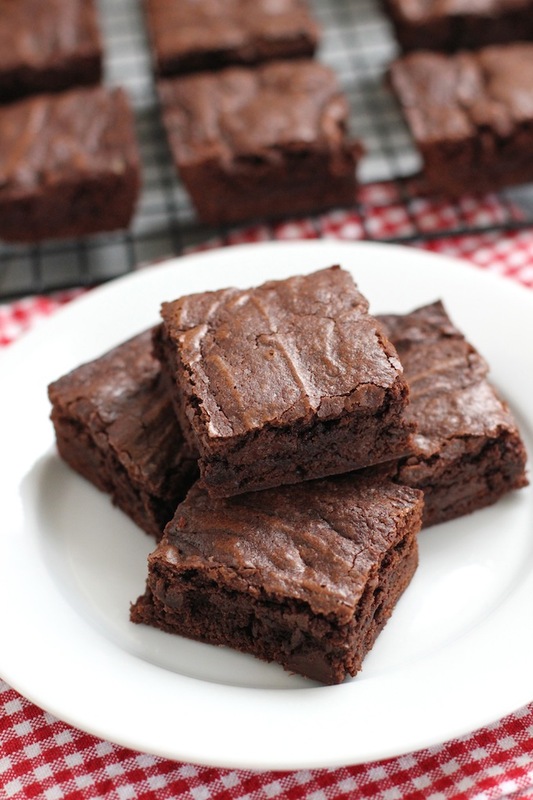 When you search for gf brownies on Pinterest you get a lot of super-wet looking black bean or eggless brownie recipes. If I get brave and try this I’ll let you know how it works. Hi Molly – sorry, I haven’t tried a gluten free version. Hope it works out for you! I am baking a batch right now. I split the recipe when it was time to put in the pan. On one side, I left them according to the recipe, and on the other side, I mixed chopped pecans to the batter.Sometimes I like my brownies without nuts, and then there are times I like a little bit of nuts in them. I can hardly wait for them to come out of the oven. ? What a great idea, Anita! Thanks for taking the time to leave a comment – let me know how they worked out! If I wish to grate and use a dark chocolate slab instead of chocolate chips, can that be done? And if yes, how much in weight? Hi Nupur – one cup of chocolate equals 6 oz of chocolate. I would roughly chop the chocolate versus grate it – so it’s more chocolate chip size. I’ve made these brownies twice so far exactly how the recipe is. I love them and so does everyone else!! Best brownie recipe so far!! Thanks for sharing! Yay – Janelle – I love these brownies too. So glad you’re enjoying them and thanks for letting me know! Yum! These look like my kind of brownies 😀 Quick question, will semi-sweet chocolate chips work? Thanks! Hi Kira – yes, semi-sweet chocolate chips should work well. I always get confused by chocolate chip labeling – but according to google “semi-sweet is dark chocolate” so they should work fine. Please let me know how it goes! Hey,i was just wondering if these will work with applesauce instead of eggs..? Hi – sorry, I’ve haven’t tried this with applesauce instead of eggs. If you do try it, let me know how it works out. Thanks! Those look perfect – there are so many variations of brownies but my favourite is a classic like this without any bits and bobs added. Hi Anna – I’m with you on classic brownies – they don’t need a whole lot of fancy ingredients since there’s so good by themselves! oh my goodness, these look so good! Totally going to try this recipe! Thanks so much, Alice – you’ll love them if you try them! And they freeze really well too! That’s a good point, Mom. This way you can make a big batch and not be tempted to eat them all – just stick a bunch in the freezer for later. Thanks, Denise – I’m definitely in the fudgey brownie camp as well. Have a good one. Go make yourself some of these brownies, Izzy – they’ll make your day. Have a good one. Yum, I’m all about the crackly topping 🙂 Pinning! Hi Medha – I love the crackly top too. Thanks for the pin! These remind me of the brownies my mom used to make! Soft in the center and crispy on the edges. Also my favorite kind! I especially love the addition of the dark chocolate chips! Thanks, Geraldine! Hi Annie – The dark chocolate chips really gives them a rich flavor. Have a great weekend!! OK these look ah-mazing! Love good ol’ brownies, so delicious! Love that these are chewy and fudgey – so good. Have a great weekend, Geraldine! Thanks, Jess – hope your weekend is great also! These look like my kind of brownies…the kind that you can’t just eat one! Hi Kathy – they are kind of addictive – I kept nibbling on them all day and I didn’t feel guilty at all about it :). Have a good one. Thanks, Traci! There are so many different kinds of brownies – it’s kind of amazing all the different ways you can make them. I’m definitely a fan of the old fashioned kind. I love the idea of ice cream and chocolate drizzle to jazz them up though! Have a good one.